THE FRANKLIN ARMS "Southwest Florida's Distinctive Hotel" Fort Myers, Florida Opposite Post Office, Overlooking Beautiful Caloosahatchee Bay. Each Room has Private Bath and Steam Heat. Spacious Lobby, Veranda, Dining Room, Cocktail Bar, News-Stand, Sun Deck on Roof. Reasonable Rates. Sun Dear People, Ended up here after a hot drive yesterday. Only about 3 hrs or so on into Miami. Will plan to get there a little after noon. Don't have to report until Mon. nite so will have time to look around a little. 5.13. 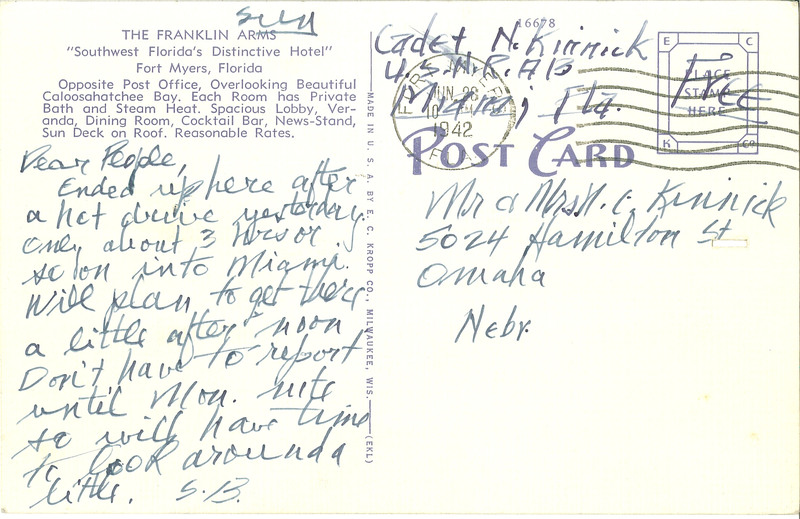 Cadet N. Kinnick U.S.N.R.A13 Miami, Fla. Mr & Mrs N. C. Kinnick 5024 Hamilton St Omaha Nebr.